Synchrotron radiation is emitted by charged particles, usually electrons, moving at relativistic speeds in magnetic fields. In a magnetic field a charged particle is forced to circle around the field line in a helical path. An accelerating charged particle emits electromagnetic radiation that is radiated along the direction in which the particle is moving. 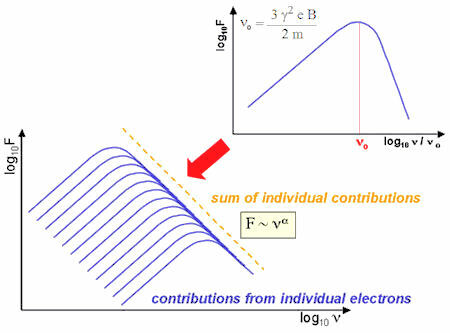 A large population of relativistic particles moving in a magnetic field will radiate over a wide range of frequencies and has a high degree of polarization (Figure 01). A moving charged particle in a magnetic field would be reflected by the Lorentz force F = q (vxB), where q is the charge, v is the velocity, and B is the magnetic induction. 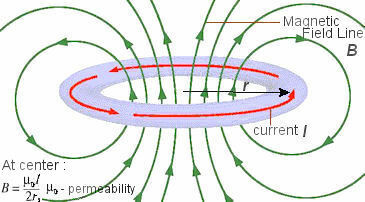 The magnetic field can in turn be generated by current loop. In a region with uniform magnetic field, the curvilinear path of the charged particle becomes a circle as shown partially in Figures 02, 03 and if the velocity has a component in the direction of the magnetic filed then the trajectory will be a helix as in the jets of many astronomical objects such as quasars or black holes; we can further identify the accretion disk to be the current loop generating the magnetic field. The cyclotron is a particle accelerator using the same principle to move the charged particles around. It is called synchrotron when the particle attains relativistic velocity. 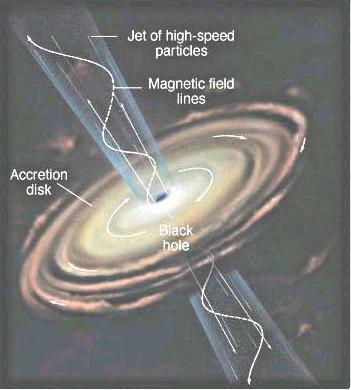 Radiation from such source is called synchrotron radiation as accelerating charge always produces electromagnetic wave. 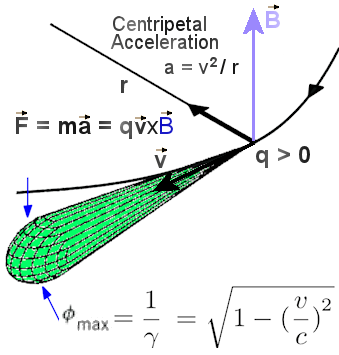 At relativistic speed the radiation pattern is collimated into a narrow beam with the maximum solid angle equals to (1 - v2/c2)1/2 (the green cone in Figure 02). Figure 03 shows an electron moves in an uniform magnetic field instantaneously. The orbital plane of the particle is in the x-y plane, the acceleration is in the y direction, the vector n points to the observer. 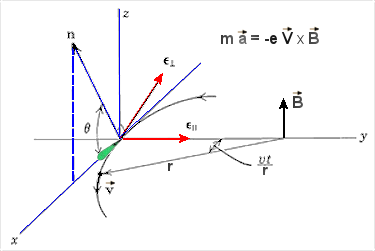 The polarization vectors (in red) are on the orbital plane, and is orthogonal to both n and . For synchrotron emission, we only see the radiation when the particle is moving towards us, i.e., when ~ 0. 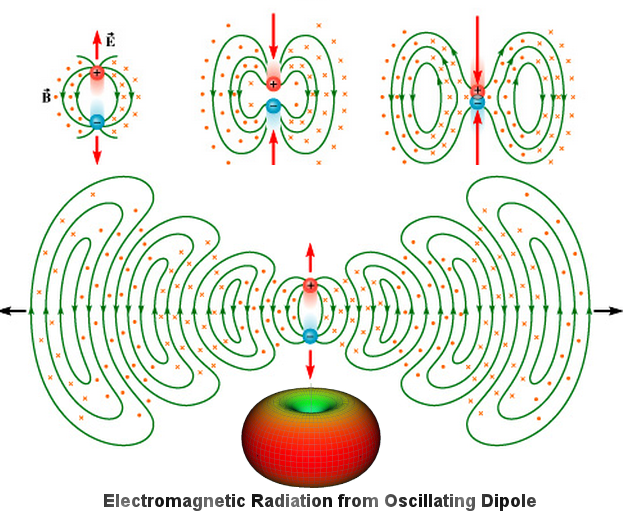 Calculation shows that for a single electron, 7 times more power is radiated with the polarization than from . The spectrum of synchrotron radiation from a single electron is shown in the diagram on the upper right of Figure 04. The combination of many individual emissions produces a power spectrum with the power between -3 and +2.5. It is -3 to -2 for pulsar, -0.7 for radio galaxy, and -1 to +1 for AGN. BTW, since the peak power occurs at o 1/m (Figure 04), LHC picks the colliding particles to be protons instead of electrons as one of the ways to minimize particle energy loss due to synchrotron radiation (reduced by more than 1000 times).